AMBERGRIS CAYE, Belize, December 5, 2017	(Newswire.com) - Every second counts from the moment you first notice this jaw-dropping offer. This is a golden opportunity for you to acquire a true gift of nature brought by Coldwell Banker, Ambergris Caye. Now you can stamp a seal that defines you as the proprietor and owner of an astonishing 50-acre piece of paradise. This magnificent property also has a beautiful waterfall, now you see why it can’t be called less of a paradise. It is located 60 miles from San Pedro Airport in the exclusive gated Mountain Pine Ridge Area in Belize, formerly known as British Honduras – an independent country on the eastern coast of Central America. It is popularly known to be a peaceful and calm settlement that embraces a lot of beautiful cultures, language, and traditions that makes life all the more sweeter. You get the chance to behold the beauty of the pristine forests, limestone caves and scenic waterfall view of over 1000 Ft of River and Creek frontage. Towering old growth Pine and Mahogany trees, majestic giant ferns and other incredible tropical plants are a variety of nature’s gift to explore. It offers firsthand the pleasure of seeing the source of the Rio Frio River flowing with ease and pushes soft breezes into the land. There are a series of natural pools and rock slide waterfalls that gives off a cooling spray of mist as it tumbles into a clear, deep swimming hole, and then return to San Ignacio through the rugged mountain terrain. This region is surrounded by caves and a flowing river which is accessible by boat. 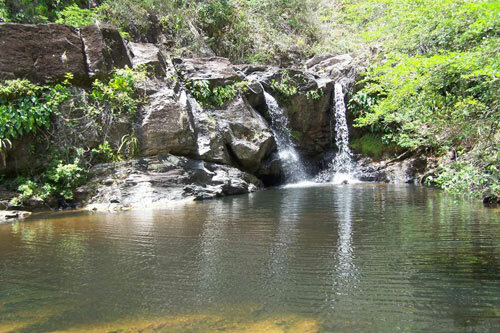 The advantage of investing in this 50-acre piece with waterfall cannot be overemphasized, it boasts of a natural habitat that is home to numerous birds and mammal species. There is a great place for bird watching and enjoying the peace of the natural environment. Not to be forgotten is the rampant shimmering natural swimming holes and rock water slides that allow for cooling relaxation and meditation. The property is also located just a couple hundred feet away from the Five Sisters Falls and the exclusive Gaia resort. It generally guarantees a reasonable price, a lot of activities to engage in, provision of important and basic amenities, welcoming you with a bounteous dining to enjoy the natural food, produce and an unforgettable nightlife. Gaia resort is widely known and popular. It is reported to be classified among resorts with five-star amenities and amazing cuisine. All you need do is stroll to dinner from your home to Gaia restaurant along the scenic river trail and experience the satisfaction that comes from being at the right place at the right time. This haven is only two miles to Francis Ford Coppola's Blacaneux Resort and an Airplane runway. It will take a two-hour thirty-minute drive (2:30hrs) or a forty minute (40mins) flight from Belize City. You can also experience an amazing view of the Maya Mountains, and a two hour (2hrs) drive or fifteen minutes (15mins) Charter Flight to International Airport with a direct flight across United States, Mexico, and Central America. The Mountain Pine Ridge area is well known for its majestic plain mountain views as well as many easily accessible ancient Caves and Mayan Ruins like Caracol, Xanantunich and Cahal Pech. Many picturesque waterfalls are also in close proximity. The biggest attraction in this area, and also an alternative route traveling to Guatemala's Tikal site, is the Mayan ruins of Caracol, which was, at one time many years back, a bustling city in the middle of a forest. The road down to Caracol is a very scenic and beautiful jungle. Any investor that seals of this wonderful deal is sure to experience an appreciation in value in the next few years as there are a lot of exciting avenues to create a sustainable investment in this location. The relief of this property offers easy creation of tourist centers for tourism as the city welcomes thousands of visitors monthly making this 50-acre property ideal for exclusive hotel investment. It also creates a corporate getaway or private estate which will yield huge revenue in few years to come. So there is really no need to look back on buying this 50-acre property as statistics shows that there is a heavy influx of people into the area who desire to settle here given the fresh weather condition, good, serene atmospheric condition, mild sun rays, and all that nature has to offer. The 50-acre piece with waterfall is priced well below market value and yet offers all comfort and sustainability required for inhabitation with a beautiful waterfall just right in front. Hurry now and make this dynamic property yours.